At the heart of the enterprise of writing in relation to research, there exists a tension between the imaginary and the informed; between the literary and the academic narrative, or, taken from a distant view: a tension between the creation of art and knowledge production. This tension does not necessarily imply and opposition, in that different writing registers (style, language, formalism, tradition, etcetera) and their corresponding research strategies have one thing in common: the author’s need to express herself and the desire to explore the ‘known unknown’. This essay discusses and shows simultaneously the attempt of me as author, both as a researcher and as a novelist, to get a grip on the notion of ‘beginning’ as mediating space between origin and destination. Embraced by the beginning (and closure) of Michel Foucault’s inaugural lecture at the Collège de France, this text explores the concepts underpinning Edward Said’s definition of the beginning as a ‘first step in the intentional production of meaning’. To connect an intention to write to the actual performance of writing, Roland Barthes proposes that the beginning, or ‘origin’, must be sought in the tendency of the author: a clear, yet elusive determination, at the beginning, in order to begin. Authorisation then comes twofold: from the desire to explore the ‘known unknown’, and from the willingness to internalise and apply multiple voices. A beginning, any beginning, has consequences for all that comes afterwards; within the text (what I am going to say next), as well as outside it (what you will gather from it), thus defining what will be in the end the significance of my attempt. uncoiled, unwound, has ceased to be vicious; it has been set free. the essential spirality of all things in their relation to time. Twirl follows twirl, and every synthesis is the thesis of the next series. ‘I think a good many people have a similar desire to be freed from the obligation to begin,’ Foucault concludes his introduction, as if to clear the space, to define the void within which he is going to build his world of words (1981: 48). The trouble with words, whether written or spoken, is not so much their existence but their tendency to elude the moment they are uttered. As if words, once departed from the gloaming of the human brain, behave like snowflakes falling from the winter sky: they change shape, consistency, transparency, density, and, depending on the general atmosphere out there: connotation. This elusion however does not imply a complete disappearance, but rather a metamorphosis: words’ meanings bend by force of new conditions. Words, like snowflakes, are driven by an innate propensity to transform. Irrespective of the initial intention with which they were launched, they coagulate, drift away, melt. The utterer – the speaker, the writer – may take great care to let land the words gently amid fellow travellers in good faith of their joint capacity to expand and make sense. But freed from ‘parental guidance’, unforeseen and uncontrollable constellations appear. They become snowman or gibberish; poem or pond. Although spoken words can be, in effect and affect, as forceful and imaginative as their written counterparts, the difference between them seems to be the apparent irreversibility of the latter –not so much of the word itself (one can always add a disclaimer), but of all that will follow in its wake. The written word suggests a solidified intention, even if that intention itself is fictitious, self-deceptive on the part of the writer, as is so often the case. Her analysis may suffer from brevity, the burden she mentions is common amongst writers. It appears that as soon as one takes to writing to put a thought on paper, the very thought undergoes a transformation. Perhaps it gains logic, beauty, clarity. It might seek reflection, destination, justification. It loses, possibly, a sense of innocence, fluidity. Considering the prose of novelist Joseph Conrad, both in fiction as in his autobiographical writing, Literary scholar Edward Said observes that ‘the chasm between words saying and words meaning was widened, not lessened, by [Conrad’s] talents for words written’ (Said 1974: 116). ‘Parental guidance’ proves itself in vain. But then: who do we think we are, when bringing forth those words? As philosopher and linguist Roland Barthes wonders: Who is speaking thus? – his answer curt and not very reassuring: ‘We shall never know’ (Barthes 1977: 142). For putting words on paper means the end of the identity of the body writing; ‘The Death of the Author’, period. In this 1967 essay, Barthes proposes that ‘a text’s unity lies not in its origin but in its destination’, suggesting that the identity of the persona of the author is secondary, if not totally irrelevant, to the life and existence of the text (148). Perhaps the trouble with words is neither their existence nor their insidious tendencies. Perhaps the trouble is: one wants something from them. 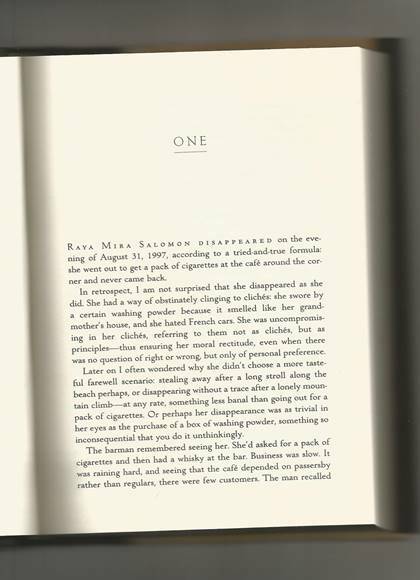 One is painstakingly working on them to bring forward this something – be it snowman or gibberish, poem or pond – without seeing yet; without sensing, at the beginning, whether the dedication and good faith will result in a language construction that has the power and conviction to represent or sketch the projected ‘known unknown’ that started off the whole enterprise. This essay is not so much about words themselves, but about what we want from them, at the beginning, to materialise our matters of concern; to bring into the light of day the beauties and the phantoms of the human mind, or, as philosopher Jacques Derrida puts it: the creation of ‘a universe added to the universe’ (Derrida 1978: 7). In this respect, Barthes’ essay ‘The Death of the Author’ points to the fontanelle of writing, ‘where our subject slips away, the negative where all identity is lost, starting with the very body writing’ (Barthes 1977: 142). For putting words on paper is a double-edged sword. It cuts into the soul of the writer – a living creature, a psychological build-up – and simultaneously into the flesh of her exteriority . And it raises the question, fundamentally: Who is speaking thus? That question may appear rhetorical. Yet in the realm of a writer’s practice it is of great importance. To begin to write means to identify one’s voice, as a writer, to be separated from oneself, writes Derrida, ‘in order to be reunited with the blind origin of the work in its darkness’ (Derrida 1978: 7). The ‘desire to be freed from the obligation to begin’, articulated by Foucault on behalf of many, no doubt, made me wonder – as a writer and a researcher – what is mattering / troubling here: is it beginning’s rupture in time, its insistence on a closure? Is it the weight of a projected intention, as if one should know from the beginning where to go? Or could it be that a beginning, any beginning, silences all other possible beginnings, silences all other voices outside and within oneself? Of the thousand ways to begin this essay (and of the many I pursued) this chance scribble, taken on a snowy December morning, has led me – my writing – up a certain path. A beginning, any beginning, has consequences for all that comes afterwards, within the text (what I am going to say next), as well as outside it (what you will gather from it), defining what will be in the end the significance of my attempt. A common-sense understanding of the notion of ‘beginning’ tells us that it refers to a point in time or space; the first part or stage of something; a background or origin. Intuitively the field seems broader, synonyms include: debut, origin, departure, source, but also cradle, womb, morning, alpha (as in: alpha and omega) and inception, adding a sense of poetry to it . Do these ramifications inform us about the principle of beginnings, specifically the beginning of writing? 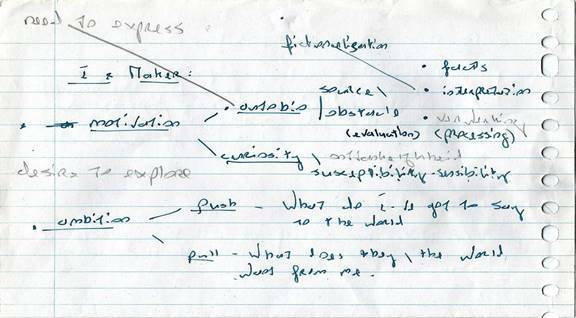 In Beginnings: Intention and Method, Edward Said applies ‘beginnings’ as frameworks for analysis of the arrangements of written words. To address the questions above, I propose to take Said’s tentative definition of the beginning as point of departure. A beginning, he suggests, is the first step in the intentional production of meaning (Said 2012: 5). Independent of its precise definition (be it a moment in time, in place, an action, or sheer poetry), a beginning indicates perforce an expectation in the offing, a possibility at a later time as a far-off moment, because without the view of even an imaginary future a beginning cannot take place in the present. Consequently, a beginning generally involves an intention – a firm state of mind in the present that includes everything that later develops out of it, incorporating both rootedness and movement. That, however, does not necessarily imply a clear and set goal here and now, at the beginning. Rather, it suggests a certain belief that some ‘production of meaning’ is possible, attainable (Said 2012: 4-5; 12). Etymologically, ‘intention’ is derived from the Latin verb intendere, purportedly stretching its meaning over the boundaries of the present into the future, while at the same time suggesting a firm grounding in the person intending: ‘to hold out’, ‘to stretch’. And, importantly still: ‘to pay attention’, ‘to turn one’s attention to’. Clearly, this particular modality of the word intention, as an attitude, alertness, does not necessarily need to have a tangible or concrete result as its aim. In his lecture series that became known as La Préparation du Roman, Barthes suggests that the intention to write can be thought of as a tendency, where the object is of secondary importance to ‘to write something to write, period, with the intermediary to write this and that’. Here he appoints the aptitude to write as an act per se, independent of any pronounced intent (or intention) other than to be performed; an activity as acute and inconsequential as sleeping or smoking (Barthes 2011: 141-142, original emphasis). ‘To write, period’, constitutes a beginning only, following Said’s definition, under the condition that its doodles and scribbles will make the slightest sort of difference at some point, even if at present they seem totally absurd or irrelevant (Said 2012: 12). Barthes’ mind seems to bend in that direction too: ‘For a long time I thought there was a Wanting-to-Write in itself: To Write, intransitive verb – now I’m less sure. Perhaps to want to write = to want to write something To Want-to-Write+Object’ (2011: 10) . A beginning then is making or producing a difference in a future time, by an act performed in the present, that difference being an intended something, as Marcel Proust writes, ‘to which [writing] alone can give reality and substance, which it alone can bring into the light of day’ (Proust 1922: 29). Because of its intentionality, a beginning connects past and present to what is to be – no matter how fictitious or self-deceptive that objective may be. As a result of this temporal dimension, combining the familiar, the previous, the existing with the novel (as in: novelty, the not-yet), one beginning is possible, while another one like it, at a different time or place, is not (Said 2012: 34; Said speaks of ‘permissible’ in this respect). Having begun once brings forward irreversible changes to any of its elements: past (material), present (act, dedication) or intended future (effort, outcome). If we accept that a beginning, specifically the beginning of writing, is at the same time an act of continuity and discontinuity – connecting elements of the past with the prospect of a future outcome by acting in the present – it follows that the writing subject (the ‘person’ as well as the ‘author’) must make peace with this paradoxical condition. Derrida may make the poetic recommendation to separate oneself from oneself ‘in order to be reunited with the blind origin of the work’, but everyday practice demands the discipline of the mind and of the body – to stay put on a chair – rather than poetry to get oneself going in the first place. To connect the intention to write to the act of writing, the true beginning must be sought somewhere in the tendency Roland Barthes suggested; some clear yet elusive determination, at the beginning, in order to begin. Apart from the performative utterance where intention, act and outcome merge at the instant (‘And God said, “Let there be Light, and there was light”’), any other beginning must be thought of as a decision that follows the act of having begun, rather than an event or a force in or of itself. And yet, to decide to have begun and to treat an act accordingly as a beginning, some kind of authorisation must be granted in order to continue, otherwise one would not so much speak of a beginning but of ‘investigation’, ‘preliminary research’ or simply a good warming-up. One of the issues raised in this essay, what we want from ‘beginnings’ in order to bring into the light of day the beauties and phantoms of the human mind, is addressed not only in philosophy, linguistics or art studies, but also in research into creative practices, notably by American-Hungarian psychologist Mihaly Csikszentmihalyi (1996). Taking a step sidewards into his field of inquiry, a material perspective emerges on what constitutes a beginning, more specifically what this ‘authorisation’ encompasses. Conditional to any form of creativity, be it in the realm of sciences or in that of the arts, is a good amount of basic knowledge, a substantial number of so-called flight hours, and a ‘thorough familiarity with the symbolic information and the basic procedures of the discipline’, according to Csikszentmihalyi (1996: 27-31). Having met these conditions, there still remains a stark distinction between the ways people execute their creative potential. ‘How do they know,’ Csikszentmihalyi wonders, ‘day in and day out, whether they are wasting their time or actually accomplishing something?’ (90). To paraphrase Said: how do they know their efforts will lead to some production of meaning? Csikszentmihalyi’s studies suggest that the difference between those who give up (or downsize, or give in) and the ones that persevere, is that the latter know at an early stage how to separate ‘bad’ ideas from ‘good’ ones. To recognise when not to waste time exploring blind alleys, it is necessary to have internalised the judgement of the field one works in (Csikszentmihalyi 1996: 115-118). To incorporate this ‘outside voice’ representing the knowledge and wisdom within one’s own practice demands a deep understanding of the shared values and ethics within the domain. Although a beginning signifies an end insofar as the act points at a destination, no matter how uncertain or obscure, it is not certain whether it will cause a meaningful outcome any more than it might bring forth nonsense, disorder, or the exploration of blind alleys (Said 2012: 39). Writers, scholars know: ‘Obstruction, obscurity, emptiness, disorientation, twilight, blackout, often combined with a struggle or path or journey – an inability to see one’s way forward, but a feeling that there was a way forward’ – these are some of the descriptions novelist Margaret Atwood gathered from sending out a circular to befriended writers asking what it felt like when they went into a new work (Atwood 2002: introduction). Neither the confident intention, nor a cheerful beginning guarantees that all assiduity following in its wake will lead to the desired destination – to any destination. Still Atwood’s friends (and Csikszentmihalyi’s interviewees) willingly surrender time and again to their adventurous embarkation. At the end of his chapter ‘A Meditation on Beginnings’, Said extracts from his meditations two kinds of beginnings that in themselves bear what is to come. First, he identifies the temporal, transitive beginning that allows one to construct work, to produce knowledge. This type of beginning imposes ‘a severe discipline on the mind that wants to think every turn of its thoughts from the start’. And, in line with its severity, this beginning ‘foresees a continuity that flows from it’. Said’s second type of beginning is intransitive and conceptual, ‘creature of the mind, a bristling paradox … it belongs more to silence than it does to language’, and therefore it is ‘something of a necessary fiction’ (Said 2012: 76-78). Though the two types of beginning can be separated in analysis, Said concludes, that is not the case in practice, for in each case ‘the unknown remains with us to haunt us from its horizon even after we have consciously begun’ (76-78). Poetic as that may sound, his analysis seems to overlook the fact that the direction of a beginning in either way – the ‘discipline on the mind’ geared at the production of knowledge, or the ‘bristling paradox’, something of a necessary fiction – defines to a certain degree what contingencies disclose themselves through the act of writing, and what remains in silence, or unseen. In other words: because of this beginning, I create immediate access to that specific material from the (un-)conscious; memories, language registers, idioms, associations, paraphrases, and so forth. Out of sheer mental economy access or ‘clearance’ is granted or refused – not forever, but for now, while the writing happens. Csikszentmihalyi stresses the importance of internalising the symbolic information and the judgement of the field one works in in order to figure out at an early stage whether one is wasting one’s time or actually accomplishing something at the beginning; the ‘outside voice’. In line with this observation, the idea emerges that conditional to any beginning, it is paramount too to have a clear notion of ‘Who is speaking thus’, as Barthes puts it: what ‘inside voice’ is invited or addressed to speak its mind in and through the very act of writing to optimally support one’s quest for the ‘known unknown’. And, importantly still, it suggests that it is paramount to know how to oscillate between them. While attending a seminar related to research in the arts, it dawned on me that to really grasp the implications of the beginning as discussed here, one should go back even further, search beyond the obvious intentions of the writing subject – surfacing at the onset; the preliminary scribbles and notes – into the somewhat slippery notion of ‘origin’. For I have overlooked the question: Why should one want to write? What makes one to want to write to begin with, ‘to write something to write, period...’? Illegible and embryonic as it is, this sketch provides some pointers to how one might conceive of the concept of authorisation, at the beginning, by the very person performing: the writer, the researcher. Authorisation can be seen as giving oneself ‘clearance’ in order to begin, based on a cheerful certainty, no matter how tenuous or fictitious, that continuation is possible and a (happy) outcome just as much. At the same time the beginning implies a disruption, writes Said: ‘…for whether one looks to see where and when he began, or whether he looks in order to begin now, he cannot continue as he is’ (Said 2012: 34). Was Derrida right after all, when he proposed that the writing subject should separate oneself from oneself in order to be reunited with what he calls ‘the blind origin of the work’? Are there two entities at work here? Does that observation lead to the conclusion that a talent for and willingness to comply with external factors (editor, critic, market place, peer reviewer, etc) is asked for in order to successfully execute one’s ambitions? That is not what is meant here. What it comes down to, I would suggest, is this paradoxical duplication of the Self. There is, my notebook diagram suggests to me, a locality (or is it force?) that can be named ‘origin’, where the impulse to ‘liberate an Other within oneself’ materialises through the writing, rather than by volition. Where the need to express collides fruitfully with the desire to explore, thus opening up the possibility of a relationship with the fertile grounds of the past: I write because I have read. For ‘I’ (the one who walks the dog, skips breakfast, who reaps the crop of life in her diary etcetera) put my pen on paper by sheer curiosity – receptive to whatever the writing brings forth. And, on the other hand, I as a ‘Maker’ (the one holding the pen, reading books not just for leisure, making flight hours, staying put in a chair etcetera) wonder what universe I shall add to the universe (to paraphrase Derrida). To establish this thinking space between the ‘Maker’ and myself in and through the act of writing – not as a concept but actual, since I am presently writing this piece as a novelist and as a researcher – the creation of such a relationship with ‘other’ voices (including the one’s within myself) is imperative. As I suggested elsewhere, this relation implies that the other becomes an inevitable part of myself: both Barthes’ ‘beloved stranger’ and the ‘stranger who is within me’ are invited to join in (Rasker 2018: 3-4). What seems to connect these voices is the desire to explore the ‘known unknown’ – within as much as around and outside the Self – by shaping the snowflakes called ‘words’. What Foucault now understands regarding his – fictitious – reluctance to begin, is this intimidating property of a beginning, where voices of others are being silenced, or excluded, to give room to this one and solitary voice; where the ‘infinitely open’ of possibilities is met with the authoritative closure of a certain destination. To him, in the capacity of the philosopher, this feature refers to the inaccessibility of discourse; the muted voices of the ‘others’. To the writer (as in: writer-artist, which by all means he is too) it points at the terminus as an inevitable consequence of having begun, ruling out the option not to conclude, not to solidify one’s stream of thoughts. – Twirl follows twirl, and every synthesis is the thesis of the next series. 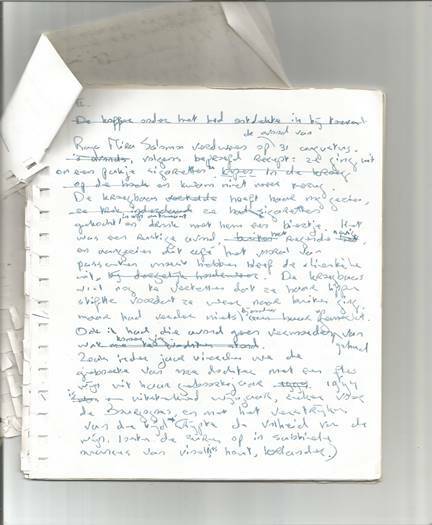 At a certain point in life I was primarily mother of two baby daughters, satisfactorily married to a young film maker, living in the Red Light District in Amsterdam, writing critical essays for a national newspaper on an irregular basis. Meanwhile I was a compulsive letter and diary writer and collector of clippings and quotes. Then I developed a desire to write. Not just to write letters and essays, nor to just clip and quote, but to Write – to inject the ‘true’ with the ‘false’, the ‘same’ with the ‘other’ (Barthes 2011: 137). To write to discover a truth; to lie, fictionalise myself, to unveil the other in me, disclose part of the world to myself. To invite words to take charge and disclose for me the known unknown within me and out there – at some point in the offing. Published three years later as a novel: Unknown Destination. Maya Rasker turned her ambition to writing essays, theatre, and scenario after a career as a producer in the film industry. Since her prize-winning debut Unknown Destination (2000), her work has been published in the Netherlands, the United States, Spain, Russia, Germany, Hungary and Turkey. In 2012 she completed her Masters in Artistic Research (Universiteit van Amsterdam) with a thesis on the position of the author after publication of the work. As lecturer at the Master of Film Artistic Research in and through Cinema (Netherlands Film Academy) in Amsterdam and other MA and BA art institutes, she designs and teaches courses on writing and (artistic) research, on the transformation of the autobiography, and on the notion of ‘beginning’ in art production and research. From 2015-2017 she was appointed Research Coordinator for the School of Media at the University of the Arts Utrecht. A PhD candidate for Leiden University (Academy for the Creative and Performing Arts), Rasker focusses on ‘creative’ writing strategies within artistic and academic research practices.